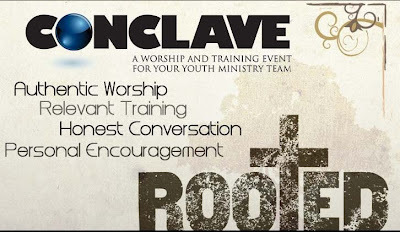 Yesterday I left Wilmington to attend the Conclave Youth Ministers Conference. This has become a highlight for me as I get to spend some time with a great friend, get some current training in my field and have some time to reflect. Yes, the driving was long but I am thankful that we got here safely. Our first session was at 3:15 pm today. Seth Buckley led a great seminar on getting Parents involved in the student ministry. Seeing him reminds me of the great times I had at Charleston Southern University and First North. He is truly a pillar among youth pastors. I also met Steve Strickland who was a CSU graduate who is currently serving at First Baptist Church Indian Trail near Charlotte. I truly desire to see our parent ministry enhanced and effective at PVBC. They may not know it but I truly long to have them be a part of their children's spiritual development. I am praying for ways to facilitate this when I get back. In a few hours I will experience worship with music led by Fee and a Message from Ergun Caner. I can not wait. Don and I knew we would spend a great portion of the day sitting so we went to the Tennessee Aquarium in Chattanooga. What a GREAT place. We saw some pretty cool things. I miss my wife terribly but it is so sweet of her to understand and hold down the fort in my absence. Also, our student and adult leaders carried on last night with the Wednesday night Backdraft and Flashover services. You would think that someone would be hurt if they knew the work could go on without them but in Student Ministry it is such a compliment. We have great kids and adults. I am blessed to just be a part of them. I may write more later but for now, cya later.